Releasing the Magic! : Every Child Matters! 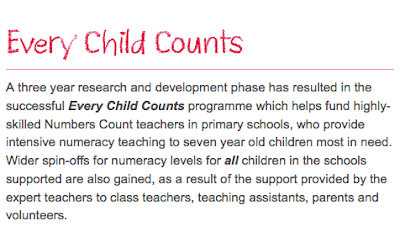 If ‘Every Child a Reader’ and ‘Every Child Counts’ achieve such significant and sustainable improvements in children’s reading and numeracy why aren’t schools making these approaches mainstream. I know how powerful the 'Every Child a Reader' and 'Every Child Counts' programmes hves been in schools in Leeds so I wasn't really surprised to read the research including the report published by the European Centre for Reading Recovery which revealed that since 2007 Every Child a Reader (ECaR) schools have shown a much greater increase in attainment in Key Stage one assessments than non-ECaR schools, in both reading and writing. We must continue to work to ensure that every child can read by the time they are seven or eight. 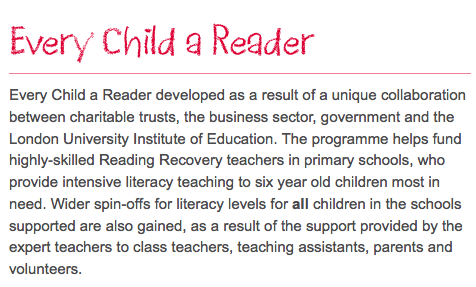 Anyone who has seen the impact of the 'Every Child A Reader' and 'Every Child Counts' programmes knows that it is possible and when you consider what it costs us coping with the consequences of failing to teach children to read and use number, failing to use and develop these programmes is stupidity on a grand scale. 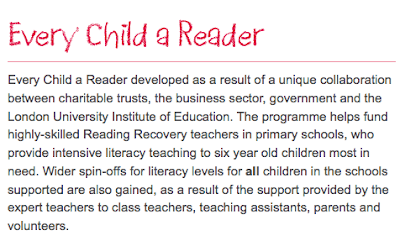 It's more and more worrying that having established brilliant programmes that work like 'Every Child a Reader' and 'Every Child Counts' we are not continuing to fund these life changing programmes. 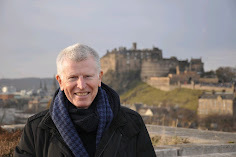 The Miracles and the Magic are Commonplace! Discipline, Creativity and the Arts! THERE IS NO FAILURE, JUST FEEDBACK! REMEMBER: It's not the critic who counts! The Power of Project-based Learning! How do we Build Resilience! No, it’s not about good enough anymore! Love the ones you're with! The Things that Make a Difference!